Scott Foods, Inc., is a specialty manufacturer of high quality sauces, marinades, and aloe vera products in Paramount, CA. Powdered stabilizer gums such as Xanthan Gum and Carrageenan are used to stabilize viscosity. These powders are difficult to disperse. They tend to form sticky lumps with partially wetted and undispersed centers. These lumps can be removed from sauce products by filtration and straining. However, if lumps are allowed to form and are removed, the viscosity of the final product may be too low. In order to avoid this problem, additional quantities of gums are often added to the formula. These gums can cost as much as $2 per pound. 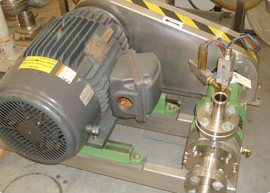 Scott Foods was using a standard Venturi type eductor and conventional marine propeller mixers to pre-disperse their stabilizer gums. Mixing time was in excess of one hour. Lumps and agglomerations were allowed to pass through the eductor. Once formed, these lumps were not completely dispersed by the action of the propeller mixer. Even after significant mixing time. 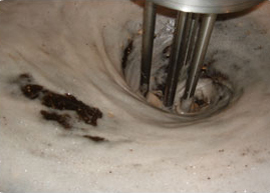 Scott Foods decided to install a Model C-2-1 Reversible Homogenizing mixer to prepare a pre-dispersion of the stabilizer gums in a 220 gallon cone bottom vessel. The "down-mode" is used to draw in and wet out powders after they have been added roughly through the eductor system. 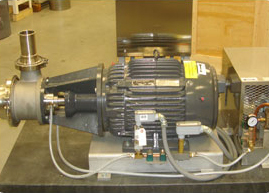 After all of the powders have been added, the polarity on the motor electric power is reversed using a reversible motor starter. 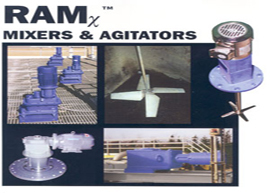 This changes the direction of flow on the high speed 3600 RPM axial flow impeller located inside the high shear mixing head. 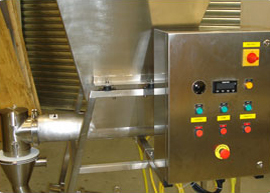 The "up-mode" recirculates the entire contents of the mixing vessel through the high shear mixing zone and off a baffle plate to deflect the flow to the side walls of the vessel. 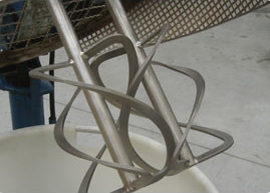 The baffle plate is lowered to a position below the surface of the liquid at rest in order to eliminate air incorporation caused by surface turbulence. After 15-20 minutes, a complete dispersion of the Xanthan Gum and Carrageenan is accomplished. This pre-mix can be easily blended into the remaining components of the sauce or marinade product utilizing low speed, low shear agitators. 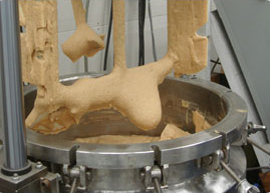 After preparing several initial start-up batches, Scott Foods realized that the viscosity of their formulations was significantly higher than when using their previous mixing methods. It was determined that the reversible homogenizer had provided such complete dispersion that each of the individual powder particles was made available to the liquid. There were no lumps or specks to be removed. Hence, a savings of 10% by weight stabilizer gum was realized. By more efficiently dispersing all of the gum, lower levels were required. Scott Foods also purchased a laboratory Model CJ-4C Reversible Homogenizer to prepare small batches and for the purposes of re-formulating all of their recipes. By preparing 1-5 gallon batches with the Model CJ-4C Reversible Homogenizer, new formulas utilizing lower stabilizer levels were completed. All of the formulas derived through testing with the Model CJ-4C were scaleable to larger batches using the Model C-2-1 Reversible Homogenizer.